Thematic expositions or pavilions at World Expos are fantastic playgrounds to explore new formats of presentations and an interactive approach to visitors. The great diversity of the audience in terms of age and culture, however, and their different demands makes finding a universal language able to reach and involve a large majority a difficult task. At Image Laundry we have many years of experience and expertise in this exciting and challenging area. 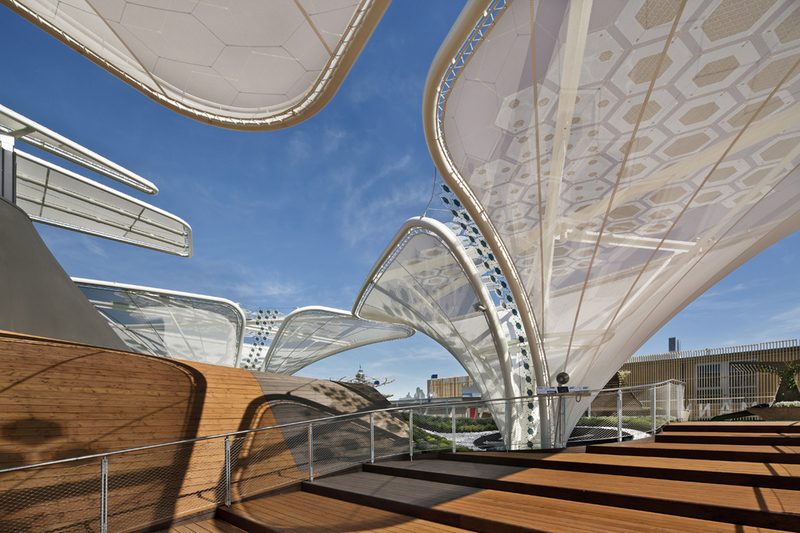 EXPO 2015 in Milan showcased the theme „Feeding the Planet, Energy for Life”, offering answers to the major future challenges of human nutrition. The German Pavilion created awareness of the forces of nature as essential sources of our food, which must be protected more effectively and used more intelligently in the future. Image-Laundry was commissioned to conceptualise and realise a mayor part of the audiovisual media in the pavilion, including the pre-show presenting the ambassadors, the ambassadors' portraits being the pavilions' leitmotiv and the "be(e) active" main-show. The first experience on the way into the pavilion was a video installation of seven screens where visitors were introduced to the ambassadors for the first time. The path through the exhibition culminated in the “Be(e) active” show. Here, pavilion visitors experienced the world of nutrition from an unusual perspective: through the eyes of a bee. A fascinating flight over Germany passing by places and people who are involved in producing and distributing food. Led by two musical artists, the “BeeJs”, visitors became part of a large orchestra – with their voices, hands, and “SeedBoards” used as percussion instruments. A simple piece of cardboard. A surprising tool, intuitive to use, as simple and easy as a book: Just fold it open and hold it into a projection. This 3D-tracking and video mapping technique, the “SeedBoard”, is a brilliant invention by our contracting agency Milla & Partner Stuttgart, that makes possible an entirely novel exhibition experience. The ambassador portraits below were costume-tailored for the “SeedBoard”, with dedicated storylines for children and free choice of language. It contributed to making the pavilion visit a very personal adventure, while bringing Germany’s fascinating technology to life. Advocates of an actively involved and committed civil society. We created portraits of six exceptional individuals who are dedicated to sustainable and safe nutrition, showing that any and everyone can make a difference. An intimate focus shares their passion for their extraordinary work in preserving natural resources as an essential part of the challenge to feed the planet. The films were projected in an uninterrupted loop and thus, instead of linear storytelling, we created portraits composed of striking characteristics and impressions. The German Pavilion „balancity“ was Germany´s interpretation of the EXPO-theme „Better City, Better Life”, dedicated to ideas for a life in balance in the city of tomorrow. As a walk-through sculpture, the German Pavilion expressed the variety of life in the city – for today and tomorrow. Image-Laundry realised the video installation called “town square” offering a humorous journey through different expressions of culture in public spaces of Germany. A luminescent scenography interacted with the video projection and involved the entire space in a vibrant experience.